The BGC Library put together a great community day yesterday, as part of their “ex libris” project. 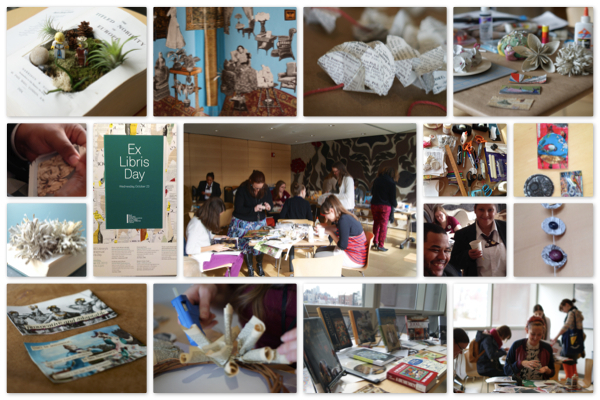 Part educational, part fun, all wonderful, ex libris took over build 38 for the day…from the lobby to the 6th floor penthouse. The whole BGC family — students, staff, faculty gathered throughout the building to learn new skills, find out about new resources available via the library, and perhaps most fun, enjoy multiple craft projects from re-useable, about to be re-cycled library materials. Projects included, buttons, flowers, magnets, chains, decoupage, wreaths. A good time ( and some lunchtime pizza) was had by all. The whole library staff, as well as the BGC facilities group made the day enormously enjoyable and a great success.